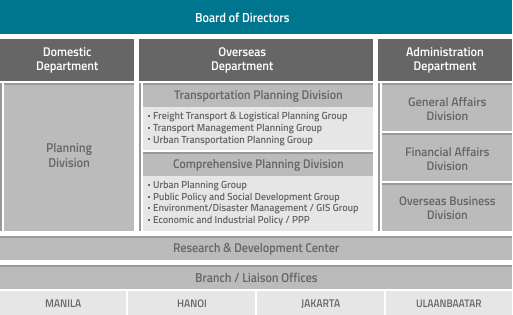 "We are a leading urban and transportation planning consultancy with an extensive portfolio in the Asia-Pacific region." Creative, resourceful, efficient. Our stable of multidisciplinary experts include trailblazers and some of the best in the industry. Responsive, comprehensive, practical. Our work bears an indelible stamp of a holistic perspective, practical approach, and responsive solutions, traits that we have been known for in all the aggregates of our expertise, be it urban development planning and strategies, transportation planning and engineering, traffic safety, regional development, logistics, environmental strategies, or disaster mitigation, among others. Reliable, respected. The hallmarks that have kept us in the cutting edge of urban and transportation planning since 1971. At any given time ALMEC Corporation has a pool of 50 experts and professionals, comprising regional and urban planners, transportation planners, engineers, environmental specialists, system engineers, economists, financial experts, sociologists, etc. Aside from this pool its expertise is supplemented by a pool of associates composed of specialists, consultants, and academicians. ALMEC Corporation also works extensively with local consultants to ensure that technology transfer, a key tenet of the organization’s philosophy, is perfectly achieved. © ALMEC Corporation. All rights reserved.